Indigenous writer, poet and story teller Herb Wharton has been awarded the Australia Council Award for Lifetime Achievement in Literature; a $50,000 award that recognises the achievements of eminent writers who have made outstanding and lifelong contributions to Australian literature. Herb Wharton is a passionate advocate for Aboriginal literature and stories, for education and cultural understanding. He is a prominent speaker at national and international festivals and a lecturer in Australian Indigenous literature. He is a Life Member of the Australian Stockman’s Hall of Fame and Outback Heritage Centre and a supporter of their Indigenous Heritage Project. 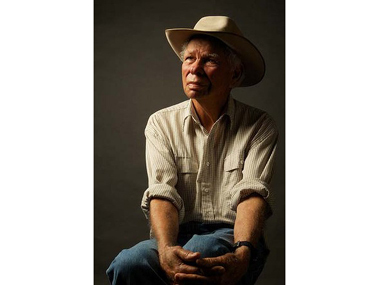 Coming to writing later in life, Herb presents a lifetime of experiences and a passion for recording the stories of the Aboriginal men and women and their role in the Australian pastoral industry. This has driven Herb Wharton‘s development as a storyteller and a writer of international note. His earlier career as a stockman drover and labourer had taken him across the Queensland outback. Since Herb began writing, he has furiously jotted down stories from his travels on scraps of paper; TAB forms, the backs of envelopes – any blank paper at hand. Herb wrote his first poem for musician Stan Coster, who went on to write many songs for Slim Dusty. The poem was written as a letter to answer Stan‘s questions ‘about the past and the present’. However, Herb quickly realised that this poem only gave rise to more unanswered questions, and so he began to write more poems to seek further answers about the land and the history of Aboriginal people. At first he hid the poems because ‘it was a real shame job; you can’t show written stories to people.’ But after encouragement, in 1990, he entered several poems in a competition for unpublished Aboriginal writers, and as a result was commissioned to write a novel for the University of Queensland Press. The resulting book, 1992's Unbranded, drew on Herb's experiences as a stockman in the Australian interior. He has since published Cattle Camp (1994) which is based on the true stories of Aboriginal stockmen and women, as well as a collection of short stories in Where Ya' Been, Mate? (1996). He has also published the semi-autobiography Yumba Days (1999), which was written during a residency at the Australia Council's Paris studio. More recently, Herb has self-published a collection of poems, Kings with Empty Pockets (2003). Herb is currently working on his next novel and has also recently purchased his home, a two-room ‘shack’ in Cunnamulla where he made his first notes and wrote his first novel. He aims to establish a trust, to ensure that his home will one day welcome and nurture visiting artists (Aboriginal and non-Aboriginal) in outback Queensland.